At the time of the Louisiana Purchase, President Thomas Jefferson believed that American Indians could be moved from the East to lands in the new territory. This would free up lands in demand by white settlers. The plan was voluntary and was considered a failure—some tribes participated, others refused. The plan also did not account for the fact that other tribes with nomadic lifestyles already occupied this land. Twenty years later, President Andrew Jackson decided to push for the Indian Removal Act. Passed in 1830, the act allowed the U.S. government to move Indian tribes in the East to lands west of the Mississippi. Indian leaders were pressured to sign treaties that would give up ancestral lands in exchange for much smaller parcels in the West. The removal policy was eventually refined into the "reservation" system, with tribes being confined to specific areas of land. The area that became Kansas was considered prime space for these "emigrant" American Indians who were forced to move west. 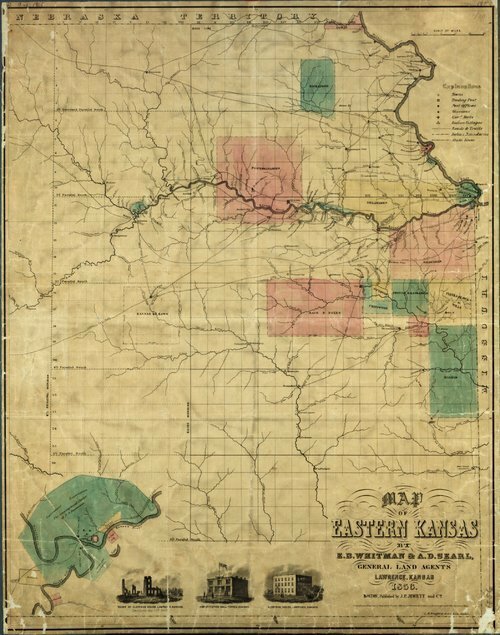 Between the years 1825 and 1850, treaties were made with more than 25 tribes to "remove" them to the region that ultimately became Kansas. These included the Chippewa, Delaware, Iowa, Kansa, Kaskaskia, Kickapoo, Miami, Ottawa, Peoria, Piankashaw, Potawatomi, Sac and Fox, Shawnee, Wea, and Wyandotte as well as several other tribes. This map in Kansas Memory shows the location of most of the Indian Reservations for the tribes listed above. The move to Kansas was not the first for many of the tribes. For example, the Delaware originally lived on the East Coast in the area of the state of Delaware. In 1829 the tribe signed a treaty for two million acres in Kansas with permission to hunt buffalo on the plains beyond the land. The Delaware people farmed their land in Kansas and adopted a constitution and a set of tribal laws. When Kansas Territory opened to white settlement, the Delawares were forced to move one more time to Indian Territory (Oklahoma). Not all tribes moved as a unit. Indian Removal policy often led to divisions within tribes. In 1800 the Potawatomi claimed land in Michigan, Wisconsin, Indiana, and Illinois. However, between 1836 and 1841, the tribe was forced to sell these lands and to be removed beyond the Mississippi River. A large number of those living in Indiana refused to move and eventually fled to Canada to avoid military conflict. Some of the tribe stayed in Michigan and Wisconsin and only a portion of the Potawatomis settled on a reservation in Kansas by 1846. In 1868 a number of the Potawatomi were removed to Indian Territory, and became known as the Citizen Band. Other portions of the tribe remained on a small reservation in Kansas, which still exists today, and is known as the Prairie Band. No matter the experiences, the various tribes were all moved into environments different than their traditional tribal lands. The peoples from woodlands and Great Lakes regions had maintained lifestyles based on hunting or fishing. The resources they found in Kansas were foreign to them. To deal with Indian Removal, the U. S. government created the Indian Office under the War Department. By 1824 it had become the Bureau of Indian Affairs with superintendents of Indian affairs for various regions. The Department of Indian Affairs with a commissioner, clerks, agents, and subagents was created in 1832. The Department of Interior was established in 1849 and the Bureau of Indian Affairs was transferred to it, though the War Department still had the responsibility of negotiating treaties with the tribes.